In pursuance of Govt. 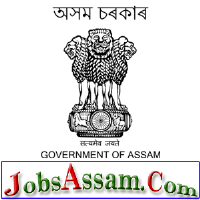 of Assam Finance Department Officer memorandum No. FSI.5/2005/Vol VI/76 dated 30.03.2012 and No. GAD (B) Letter No. 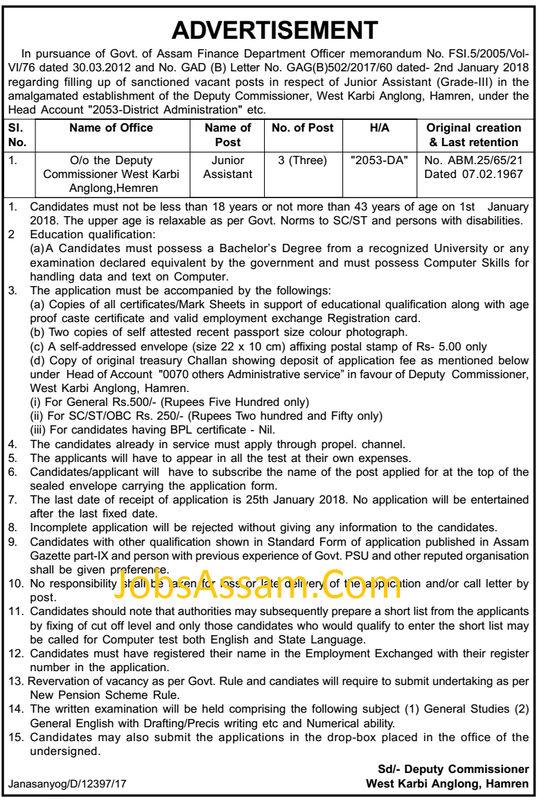 GAG(B)502/2017/60 dated- 2nd January 2018 regarding filling up of sanctioned vacant posts in respect of Junior Assistant (Grade-III) in the amalgamated establishment of the Deputy Commissioner, West Karbi Anglong, Hamren, under the Head Account "2053-District Administration" etc. 1. Age : Candidates must not be less than 18 years or not more than 43 years of age on 1st January 2018. The upper age is relaxable as per Govt. Norms to SC/ST and persons with disabilities. (a)A Candidates must possess a Bachelor’s Degree from a recognized University or any examination declared equivalent by the government and must possess Computer Skills for handling data and text on Computer. (a) Copies of all certificates/Mark Sheets in support of educational qualification along with age proof caste certificate and valid employment exchange Registration card. (d) Application Fee: Copy of original treasury Challan showing deposit of application fee as mentioned below under Head of Account "0070 others Administrative service” in favour of Deputy Commissioner, West Karbi Anglong, Hamren. >>(iii) For candidates having BPL certificate - Nil. 4. The candidates already in service must apply through propel. channel. 5. The applicants will have to appear in all the test at their own expenses. 6. Candidates/applicant will have to subscribe the name of the post applied for at the top of the sealed envelope carrying the application form. 7. The last date of receipt of application is 25th January 2018. No application will be entertained after the last fixed date. 8. Incomplete application will be rejected without giving any information to the candidates. 9. Candidates with other qualification shown in Standard Form of application published in Assam Gazette part-IX and person with previous experience of Govt. PSU and other reputed organisation shall be given preference. 10. No responsibility shall be taken for loss or late delivery of the application and/or call letter by post. 11. Candidates should note that authorities may subsequently prepare a short list from the applicants by fixing of cut off level and only those candidates who would qualify to enter the short list may be called for Computer test both English and State Language. 12. Candidates must have registered their name in the Employment Exchanged with their register number in the application. 13. Revervation of vacancy as per Govt. Rule and candiates will require to submit undertaking as per New Pension Scheme Rule. 14. The written examination will be held comprising the following subject (1) General Studies (2) General English with Drafting/Precis writing etc and Numerical ability. 15. Candidates may also submit the applications in the drop-box placed in the office of the undersigned.